Despite economic turmoil and the ongoing bailout drama, the greenback has rallied lately. Experts see more gains ahead...which should help fight inflation. Should the Senate pass its revised version of the $700 billion bailout bill? The dollar has rallied against the euro in the past three months even as the financial crisis in America intensified. NEW YORK (CNNMoney.com) -- Stocks and bonds have been whipsawed the past few days as investors try and figure out whether a financial bailout plan will be salvaged and what that will mean for the U.S. economy. Stocks plunged and bonds soared Monday after the House rejected the bailout. The opposite happened on Tuesday as hopes grew for a new package. But one thing remained constant: the dollar rallied against the euro both days. And so far Wednesday morning, stocks are down, bonds are up and...the greenback is up yet again. 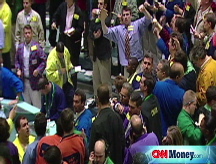 Talkback: Will the dollar keep rallying even if a bank bailout is passed? In fact, the euro is down about 13% since hitting a record high of nearly $1.61 against the dollar on July 15. It even fell 4% against the dollar in September. What gives? At first blush, it would not seem to make sense that the dollar is strengthening at a time when the U.S. financial system is facing such a severe crisis. Now that September is mercifully over, consider just how dramatic the events of the past month were. Let this all sink in. The government seized mortgage financing giants Fannie Mae (FNM, Fortune 500) and Freddie Mac (FRE, Fortune 500). Lehman Brothers (LEH, Fortune 500) went belly-up. Merrill Lynch (MER, Fortune 500) gave up nearly a century of independence and sold out to Bank of America (BAC, Fortune 500). AIG (AIG, Fortune 500) collapsed. Washington Mutual (WM, Fortune 500) became the biggest bank ever to fail. Wachovia (WB, Fortune 500) dumped its banking assets in a fire sale to Citigroup (C, Fortune 500). Well, as paradoxical as it may sound, some think the dollar can continue to rally against the euro precisely because the U.S. economy is in such weak shape. "Imports are going down as consumers in the U.S. pullback on spending," said Yanick Desnoyers, senior economist with National Bank Financial in Montreal. "That cuts the trade deficit and should lead to more upside for the dollar." With that in mind, Desnoyers predicts that the euro could fall another 7% or so in the next year to about $1.30 from its current level of around $1.40. "The U.S. dollar bear market is over," he said. Another reason the dollar may be gaining ground is that European economies are also weakening. In a note to clients this morning, Ashraf Laidi, a currency strategist with CMC Markets US in New York, wrote that reports of short-term buying of dollars by struggling European banks is helping to prop up the dollar further. He added that there are talks of a weekend meeting between the leaders of France, Germany, Britain and Italy with European Central Bank president Jean-Claude Trichet to discuss the spread of the credit crisis to Europe. This, Laidi suggested, "underlines the gravity of the problems on hand" in Europe and could lead to the greenback gaining more ground against the euro as well as the British pound. The dollar gained 2% against the pound in September and has risen 11% against it since mid-July. So what's this mean for U.S. consumers? It appears to be a case of good news because of bad news. Although the U.S. economy is in bad shape now, the fact that Europe's economy is also taking a hit, could help alleviate some of the inflation pressures that have taken a big bite out of consumers' wallets this year. Desnoyers said that eventually, the ECB will have to match what the Federal Reserve has done and start lowering interest rates in order to try and stimulate European economies. That should lead to a stronger dollar and a further pullback in the prices of imported goods, particularly oil. Desnoyers predicts that crude prices, which dipped below $100 a barrel Wednesday, could fall as low as $80 a barrel over the next year. "The fact that the dollar is increasing again is good news regarding import price inflation," he said. "It is easier to control inflation when your currency is rising." Still, there is a big wild card out there that could threaten the dollar's recent rally: the bailout package. In theory, if Congress passes some form of a financial rescue plan, that could hurt the dollar. To pay for the plan, the government would likely issue more U.S. Treasurys and this increased supply should force the dollar lower. But Michael Moebs, an economist with Moebs Services, an independent economic research firm based in Lake Bluff, Ill., said he thinks the dollar could continue to rise even if some form of a bailout is passed because the rest of the world is getting hurt by the credit crunch. "Normally you don't see the dollar strengthen during a downturn or recession. But the European banks are suffering the same problems. Clients we have in Australia and Asia are saying the same thing," he said. "We're not alone in this. And when you take a look, basically the U.S. and the dollar is still seen as a safe harbor," he said. Desnoyers agreed. He argued that even if the U.S. sells more Treasurys, there will be demand for them - for the same reasons that Moebs explained. "Yes, there will be more Treasurys," he said. "But it will not be high enough to cause a panic selloff of the dollar."